People living in a neighborhood in downtown Indianapolis say a hooded man has been stealing Halloween decorations, furniture and other items from their porches at night. INDIANAPOLIS -- People living in a neighborhood in downtown Indianapolis say a hooded man has been stealing Halloween decorations, furniture and other items from their porches at night. One victim who lives on Damon Street posted the images below from his home surveillance camera on Nextdoor this week. He tells RTV6 that he loves living downtown but the thefts have become a growing problem. 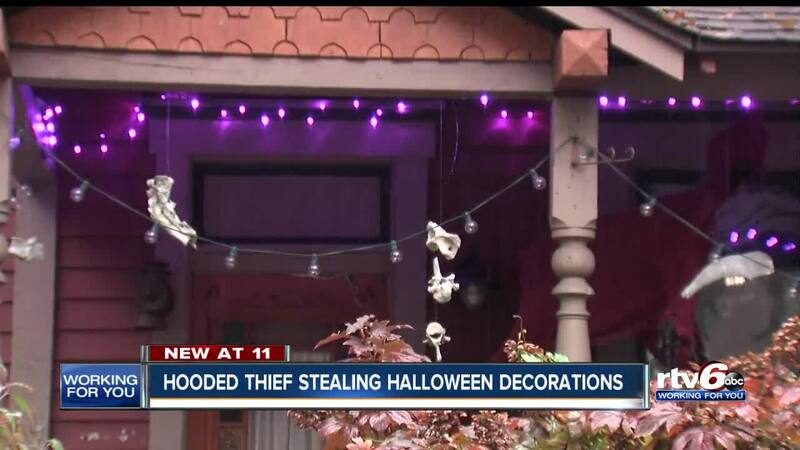 One neighbor said the hooded thief first tried to steal a Halloween Skeleton from outside his home and then realized it was zip tied to a rocking chair, so he stole a vase with balloons instead. Neighbors eventually found some of the stolen items scattered down the street. If you have any information on the hooded thief contact IMPD or Crime Stoppers of Central Indiana at 317-262-8477.